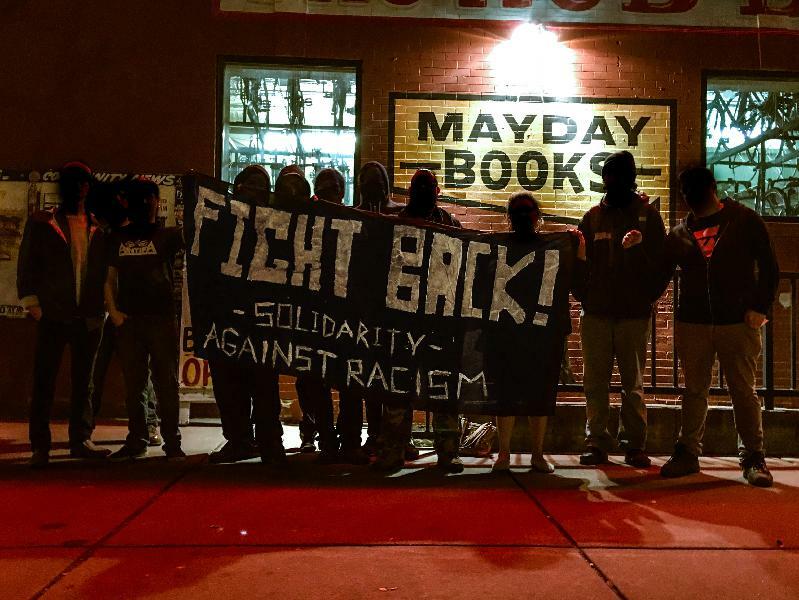 Monday night, approximately a dozen gathered in Minneapolis in solidarity with the anti-racists stabbed and arrested in Anaheim the week before when confronting the KKK. On February 27th, rebels converged in Anaheim, California to shut down a planned KKK rally. Upon the arrival of the Klan members, they were fiercely confronted and driven out as quickly as they had come. During the brawl, one of the white supremacists stabbed three people. The police, who initially arrested the man, let him go claiming that he acted in self-defense. We do not place any legitimacy in the police or the laws they enforce: taking action against white supremacists needs no justification. This is one of many clashes that mark an escalation of conflict in recent years. Here in Minneapolis we experienced this ourselves when white supremacists opened re and injured five people at the 4th Precinct occupation just a few months ago. We cannot appeal to the state to settle these conflicts. The state has its own interest in maintaining law and order, and we know this order is based on structural white supremacy. While it’s most visible manifestations are confederate flags or police murders, white supremacy shapes our entire society in the most insidious of ways. An attack on the functioning of the system is therefore an attack on white supremacy. We cannot wait until the far-right strikes again, or until the next police shooting; the time to act is now. We cannot elect leaders or enlist in organizations to do this for us, we must do it ourselves.